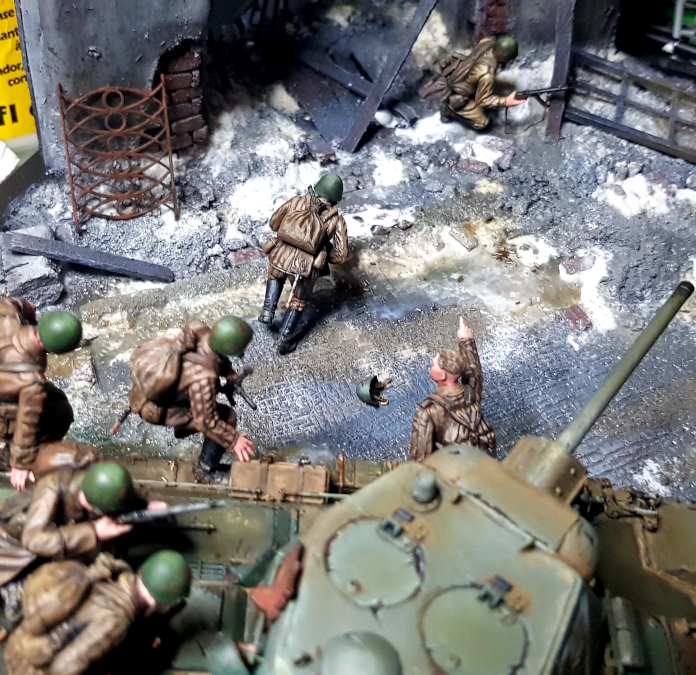 I'd started a thread in the Soviet section but as the project has evolved into a diorama involving some figures and a base I thought it best to start a new thread here as it is no longer strictly 'armour' now. 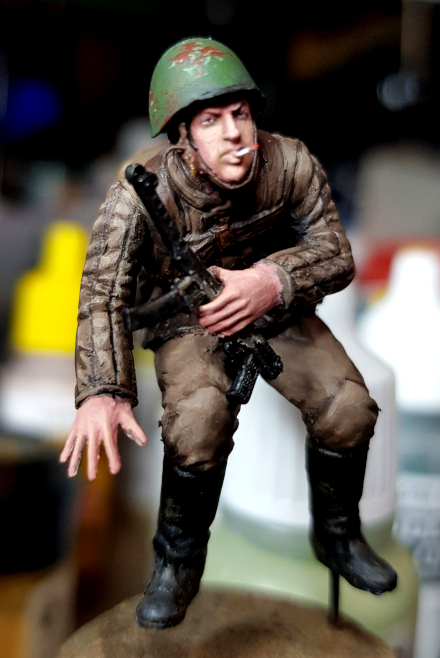 I am planning to have the T-34 covering an infantry unit dismounting under small arms fire. 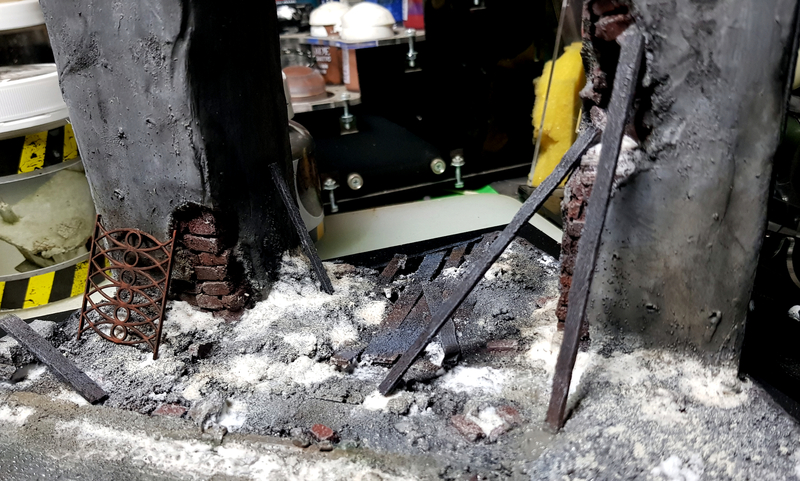 I'll have a ruined building that the infantry are moving into for cover. 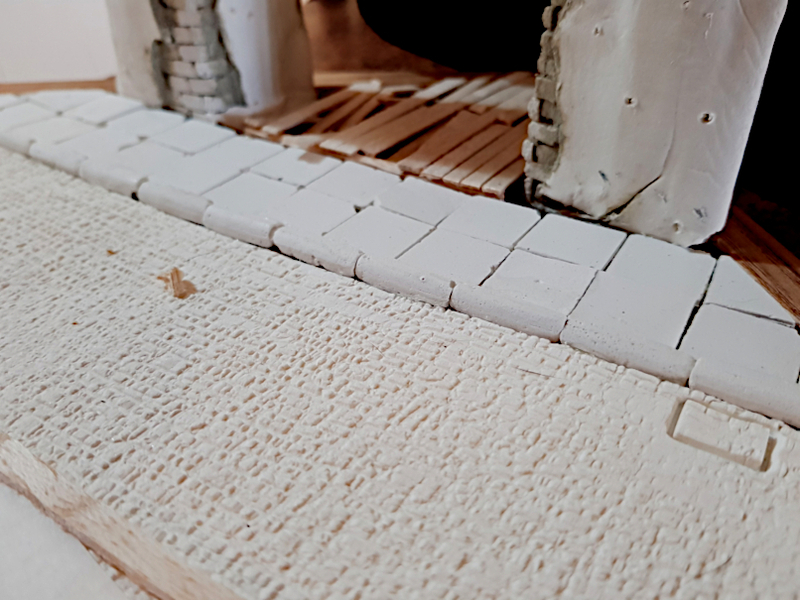 The road section is made from an air-dry clay layer, that has had texture added with a roller from 'green stuff world'. 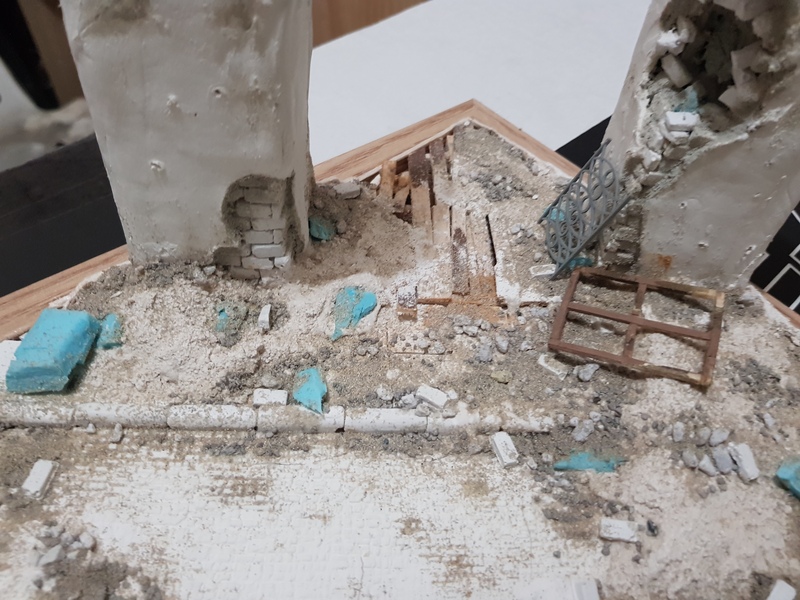 I dont think enough of the environment will be visible to put it in a specific city, though I did base it almost entirely on photos of Kharkov in early 1943. 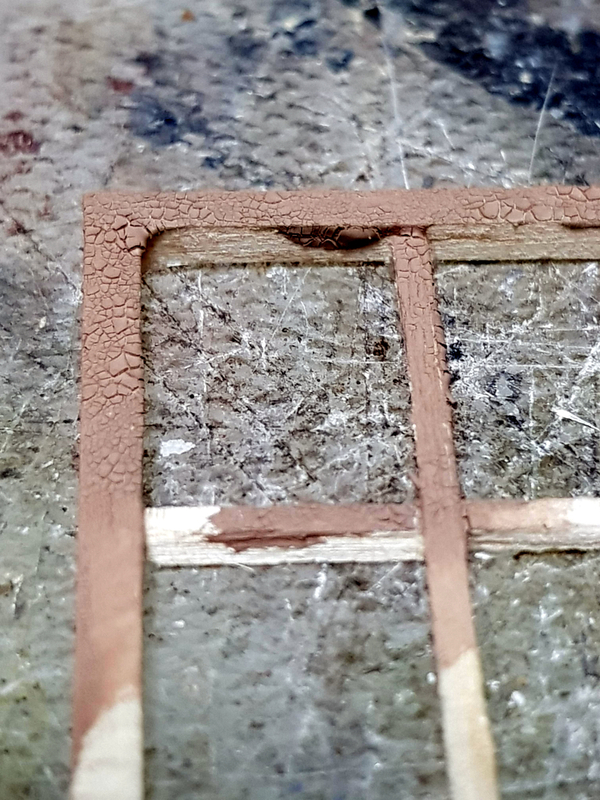 I added a small part of a tram rail as this is something seen in the reference pics I looked at, and it adds a little interest to what would otherwise be a fairly boring part. 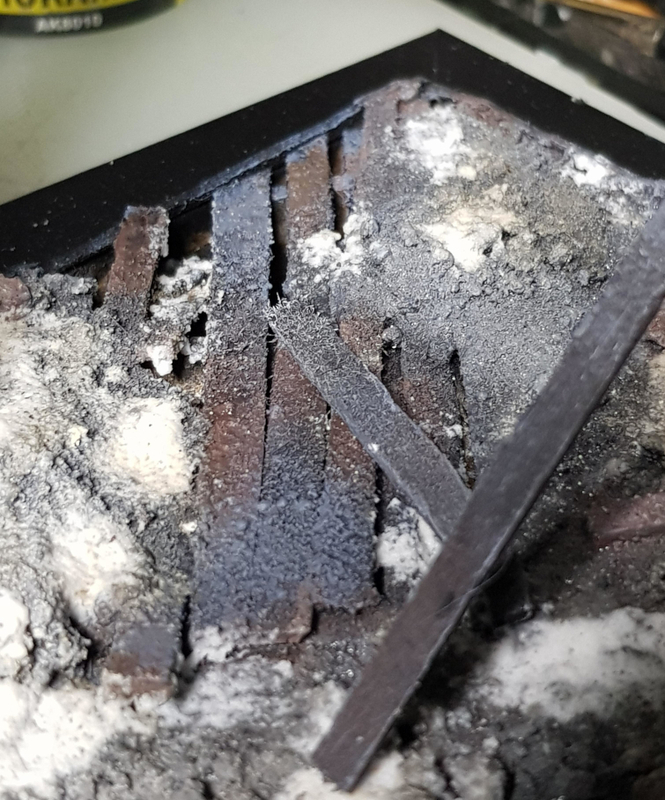 Between these will be some concrete and brick chunks, burned wood and possibly some burned furniture or something like that. 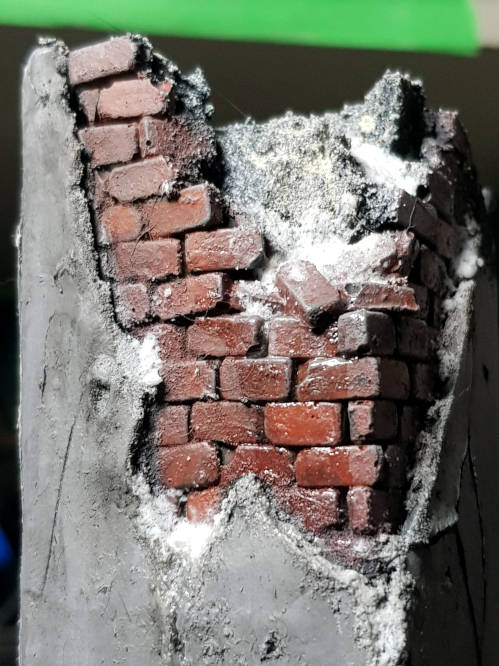 I've been working on the base mostly with the small amount of time I've had. 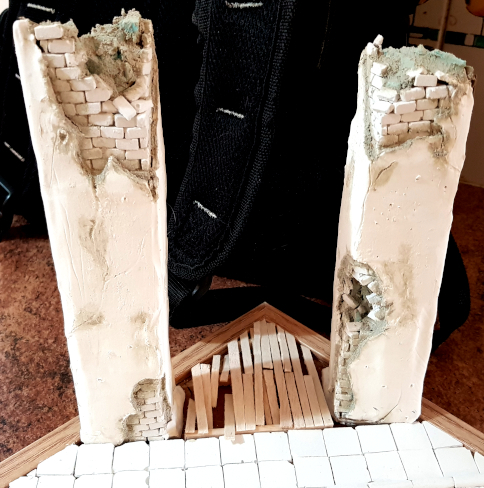 I've been adding detail to the concrete pillars, and put together a damaged floor using balsa wood. 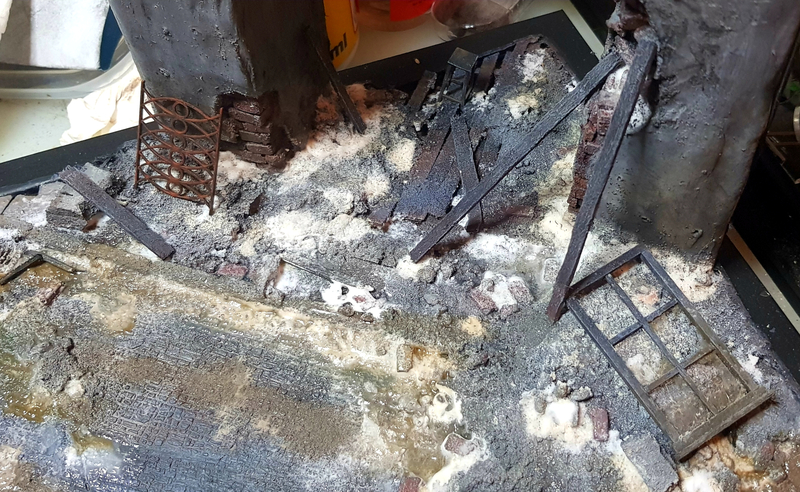 I don't think much of the floor will be visible, as there will be a heap of rubble in there and fire damage, but better to have it there just in case! 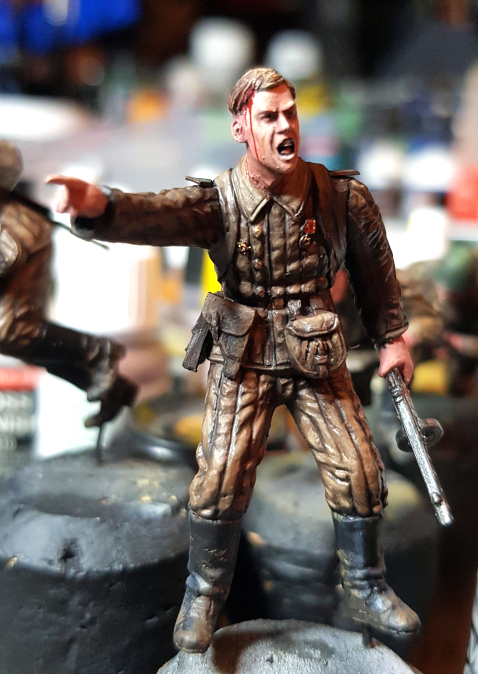 Hopefully next weekend I'll be able to start painting, but we'll see. 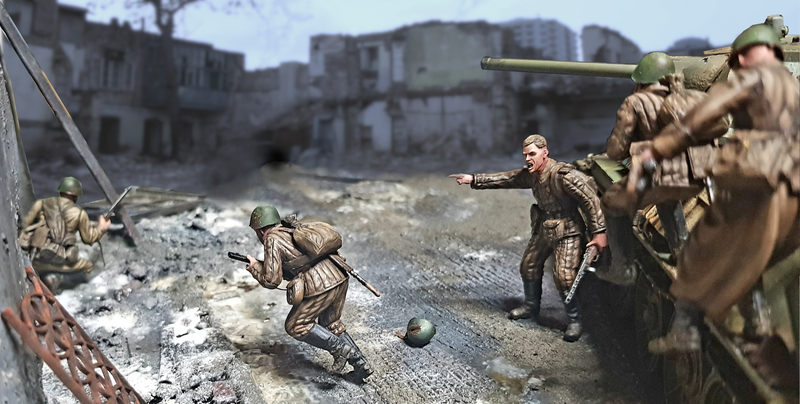 The figures and T34 look great. Lots of nice stone and groundwork here!. I love the low tech solutions,this is my favorite way. I'm following this one Steve, really like what you've done so far. BTW, I'm Melbourne based as well, north-eastern suburbs. Where are you located? 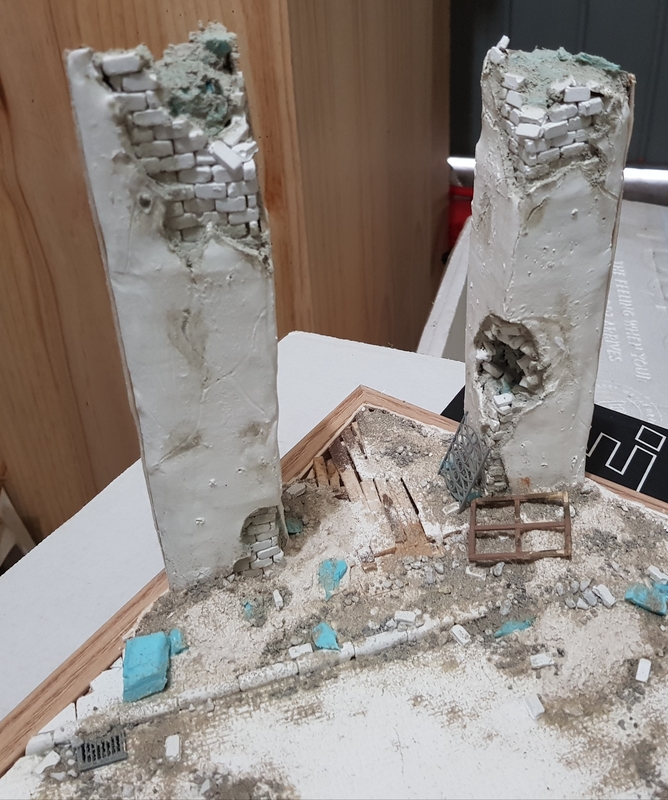 THe concrete pillars came out really well, especially with the basic materials you used. 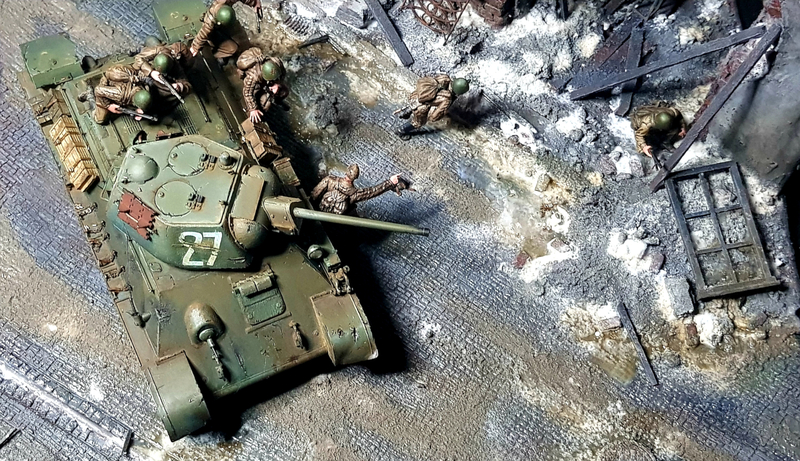 The T 34 and figures look great. 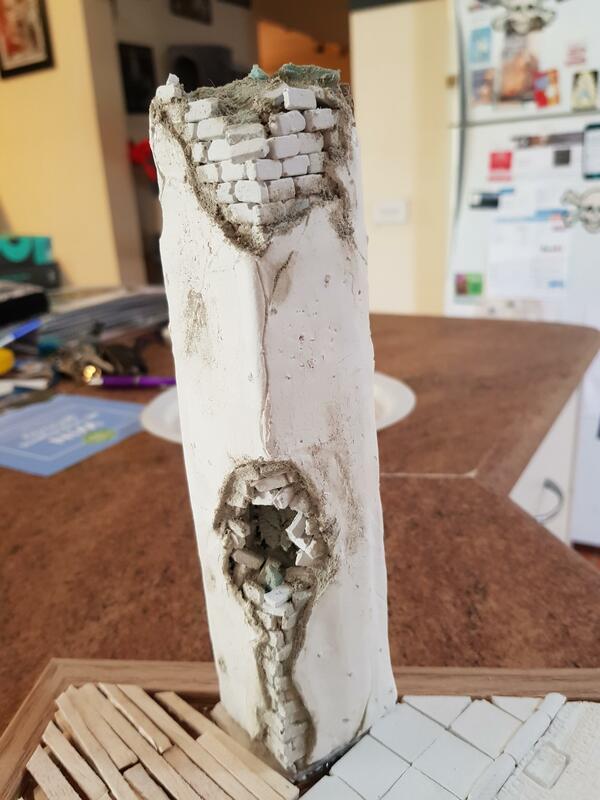 Cheers Shawn, I've never made anything quite like these pillars so im learning as i go! 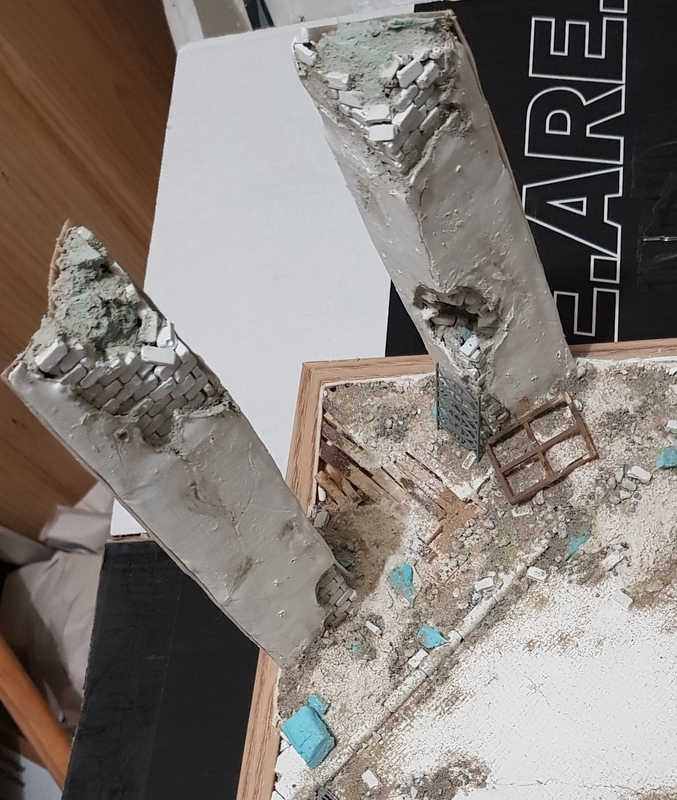 Slow going as usual, but I've laid down the rubble for the base, and finishing details. 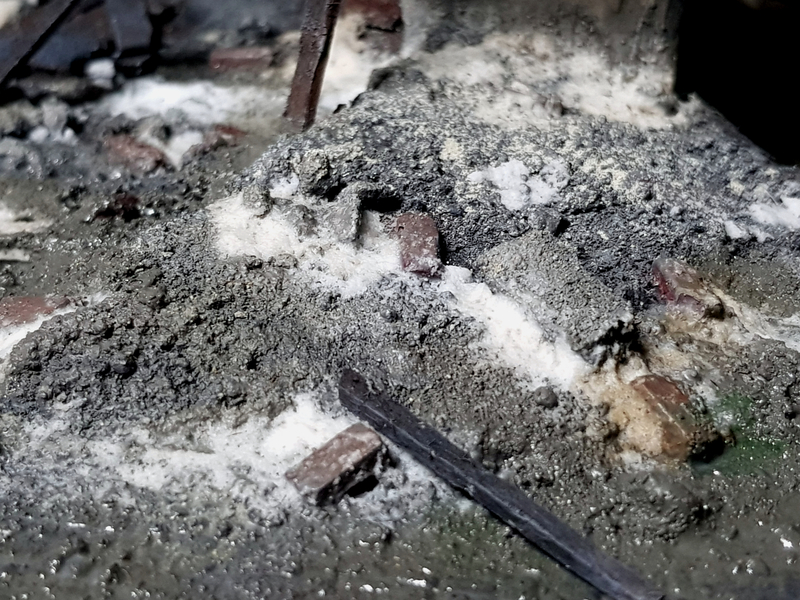 The rubble is built up with a couple of layers of wall filler, then various consistencies of sand were built up. 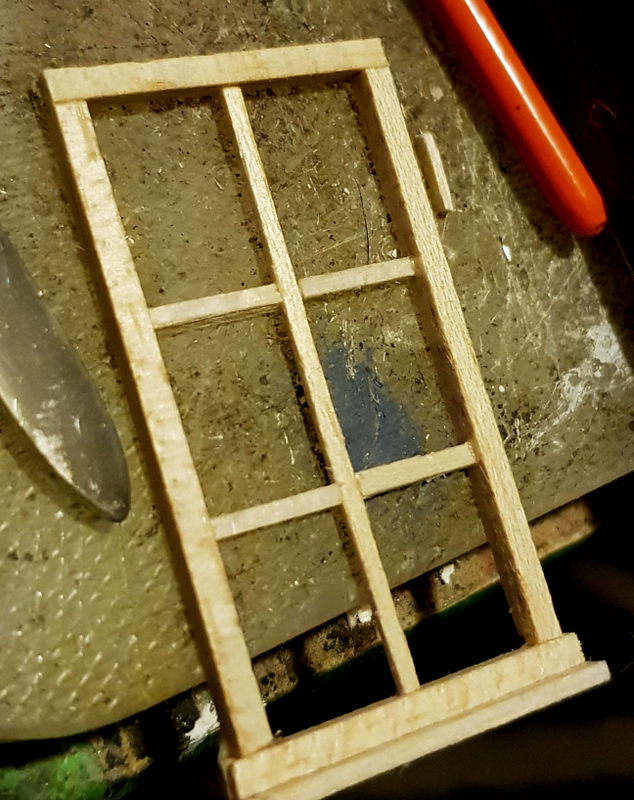 Theres also a window frame from balsa, and an old wrought iron railing from MiniArt. Thanks for looking! should have some paint on it in the next couple of days! This is really nice work Steve, I'll be following your progress. 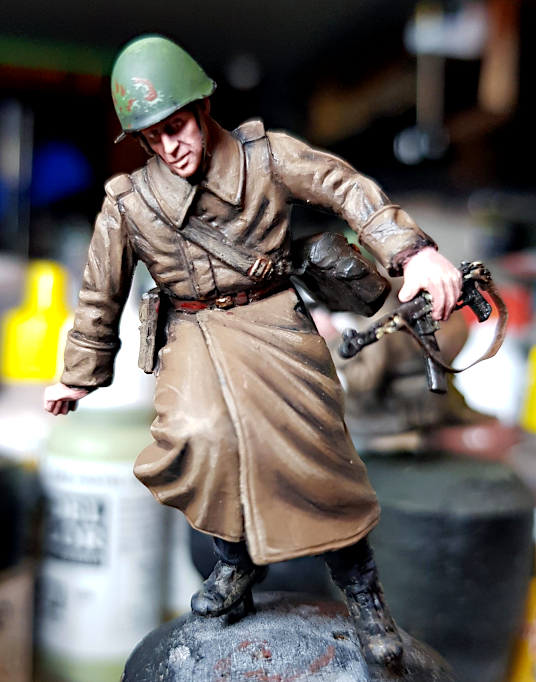 Really nice paint work on the figure with the long coat. The intention is for this to be just after winter in the Ukraine around 43, so there will be some snowfall, but not enough to cover everything. Looking really good. Great use of the cardboard, the thought to use it like you have would have never have crossed my mind. 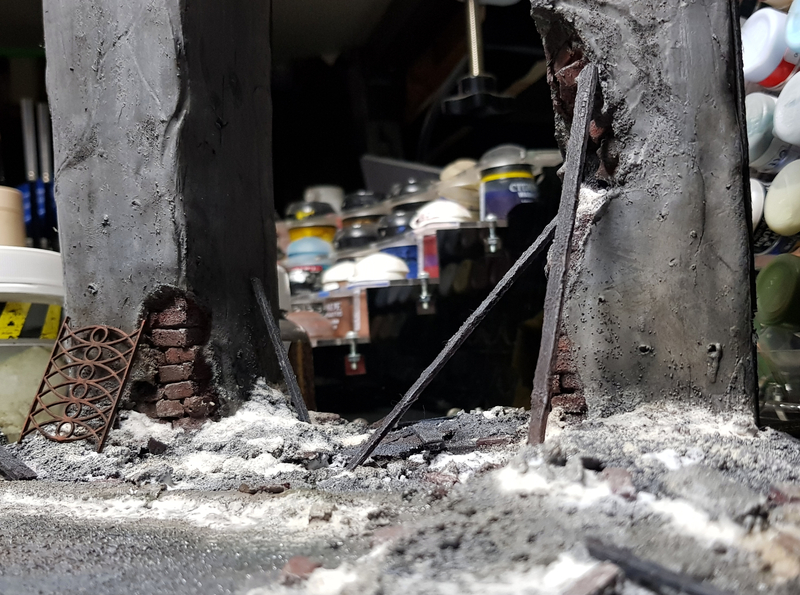 Nice work Doc , figures , T34 , distressed columns came out great , everything's falling into place !!! 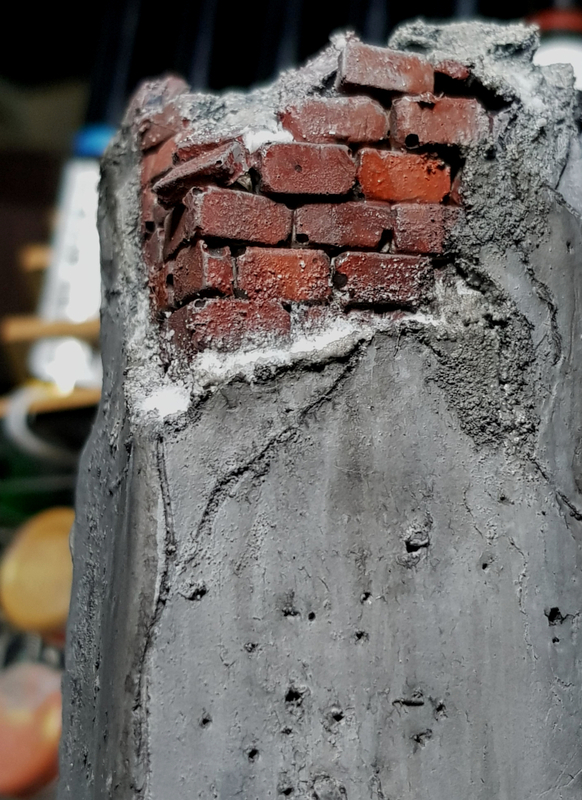 This is just me so it doesn't carry much weight but the columns look perfect with the concrete/mortar/stucco in the light color before you painted them dark . 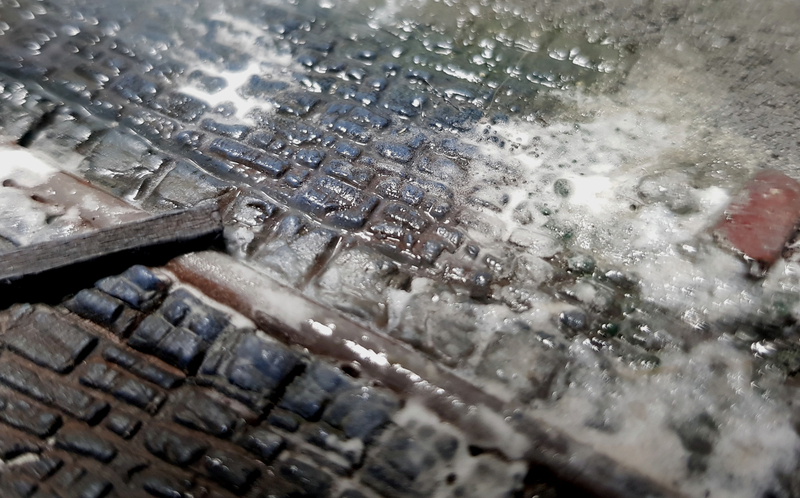 The light color with a sooty wash would bring out more distressed detail, being dark that detail is lost . Please don't take this the wrong way the columns came out very cool and like you said better pics to follow . Thanks mate! I have an abundance of cardboard around the house so I try to use it for anything I can! 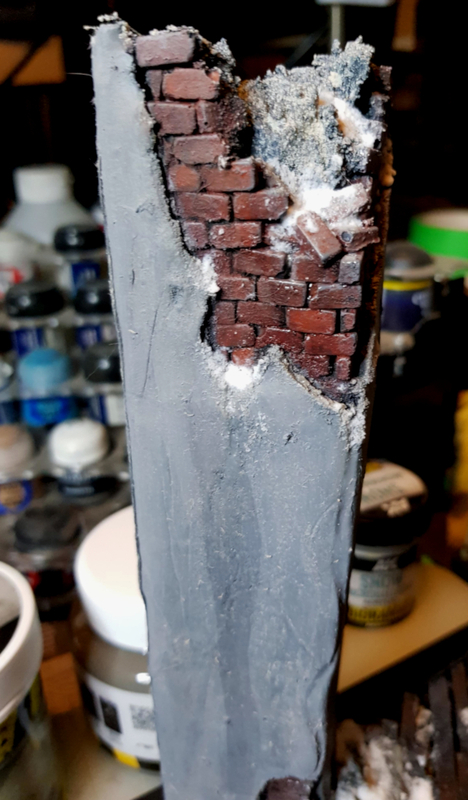 I think the bricks may look a little too dark, so I may lighten them up a bit. 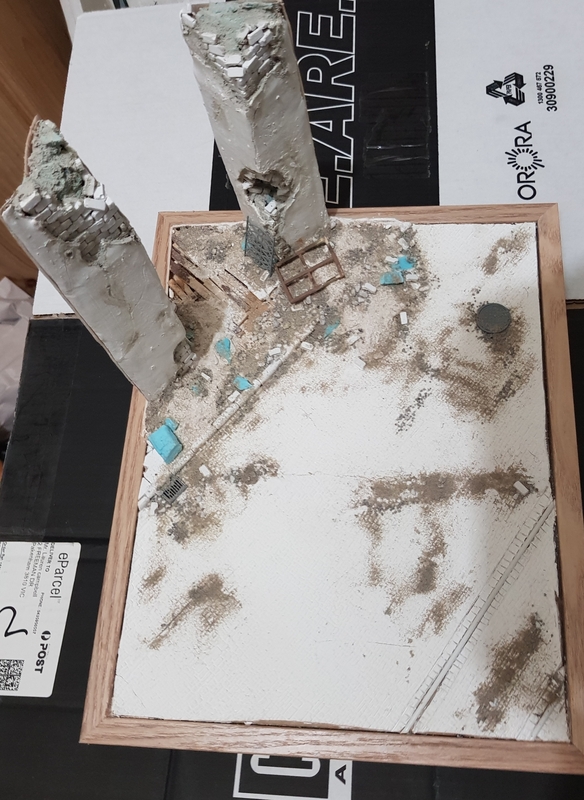 The concrete will get a wash, and some enamel and oil streaking, and I want to do some fire damage with the airbrush but I'm not sold on that idea yet so we'll see! I am really not too happy with this, and will redo it because I'm sure with a little more care I can do a better job. 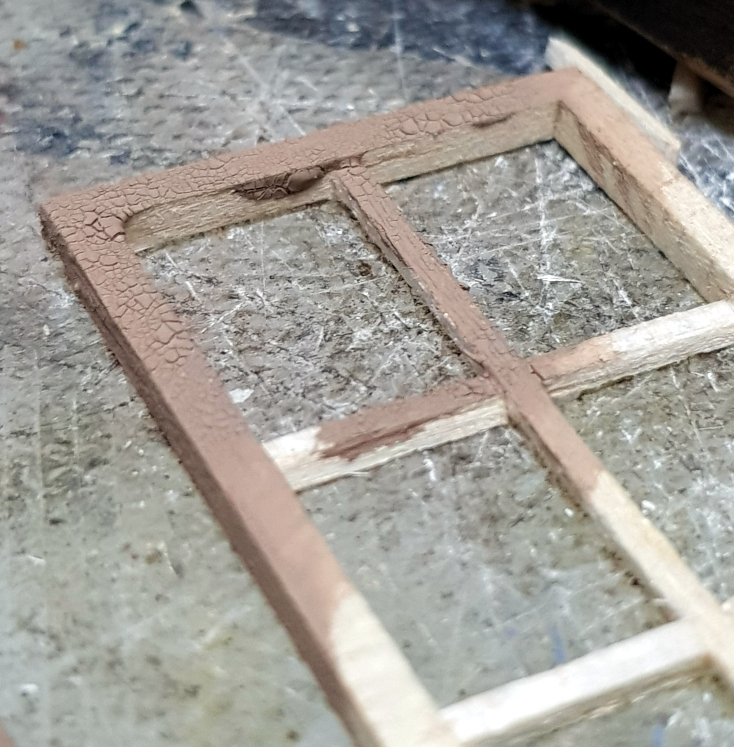 This one does act as a proof of concept though, and I learned a whole heap about working with balsa wood, and doing the cracked glass. Beautiful !! cool , much more gooderer betterer . Thanks mate! 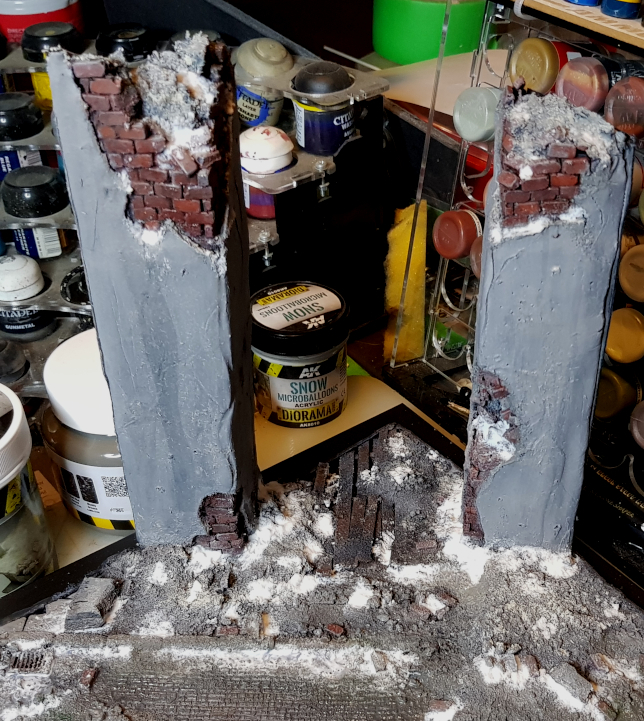 I think I’ll need to invest in some brick coloured powders, I've got most other colours but not a brick red. 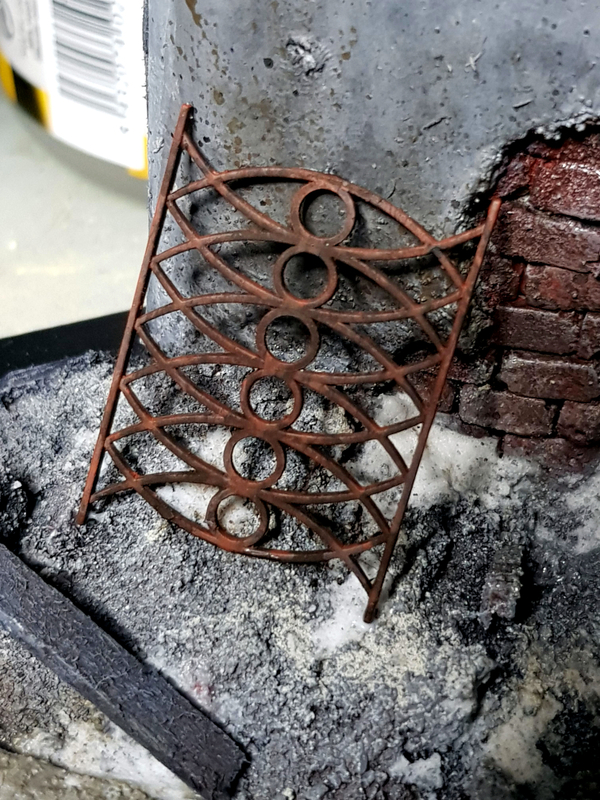 The rust reds might work? 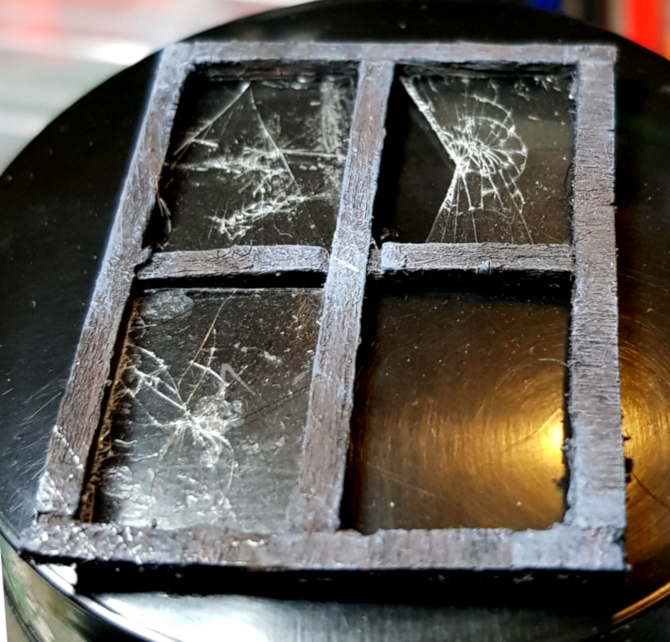 The glass is done by taking some microscope slide covers, which are very thin glass, and sandwiching one between two layers of clear sticky tape then bending them to crack. The top right one is the same thing, but after some playing around I found I could just take some scissors and cut a piece out. Nice work Doc , I like how your windows came out and the debris is falling into place , no pun intended . Lots of very good work going on here so far. 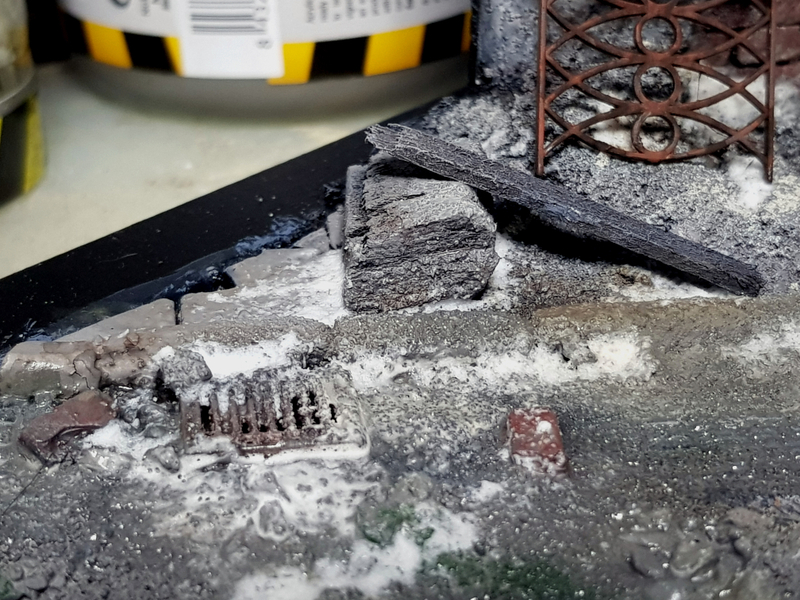 The debris and pillars came out great along with the busted glass and the ice and snow effects! 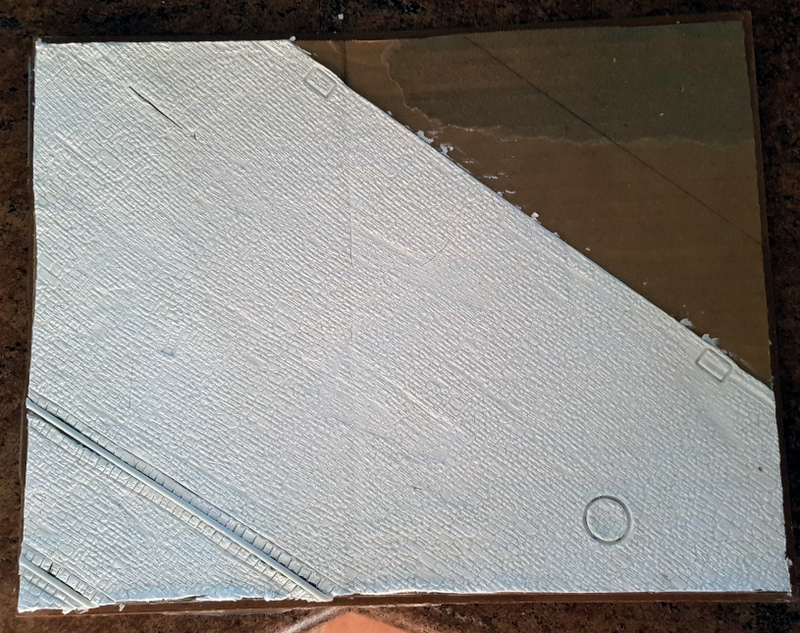 I would suggest in the future try switching to plastic strip and stock to make your window frames. Much easier to work with and more "in scale". The balsa tends to have a grain way too large IMHO. Just my opinion though. The busted glass is superb though! Nice idea. 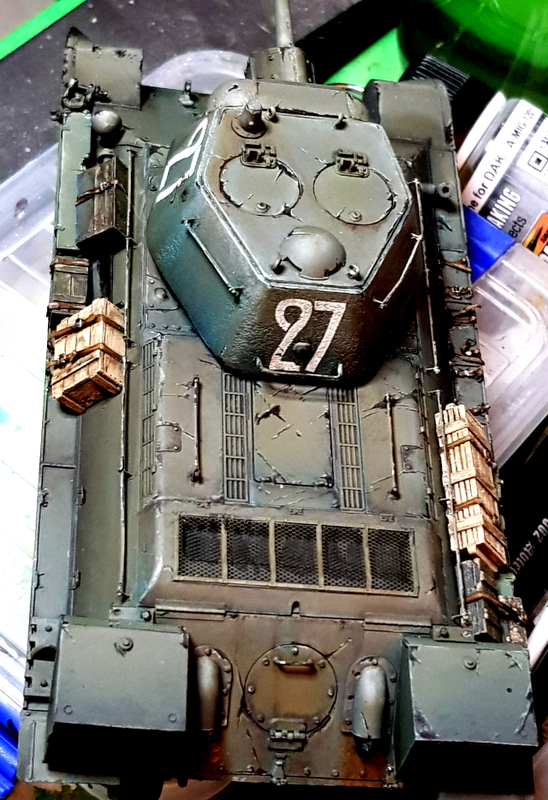 Nearly finished with this one, some minor details to be added, and then the actual base frame will get some paint, but it is about 90% there. 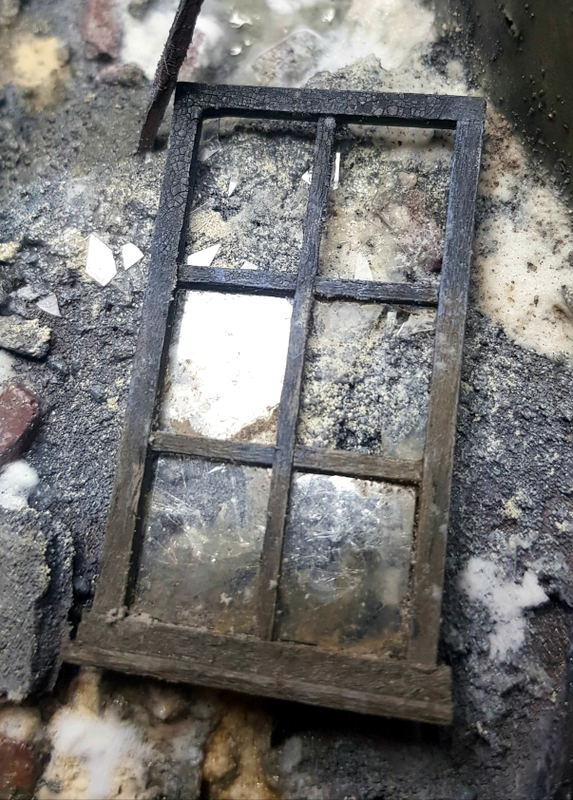 Here's the new window frame - I had to angle the light to pick up the broken glass pieces in the rubble as they are very hard to see, so i might put a pigment wash over them to make them more noticeable. This is looking great. I love the fact that I saw the pictures first and immediately knew what the story was, which was only confirmed when I read your description. Looking forward to the last few steps you got there. Dang nice job on the whole thing. 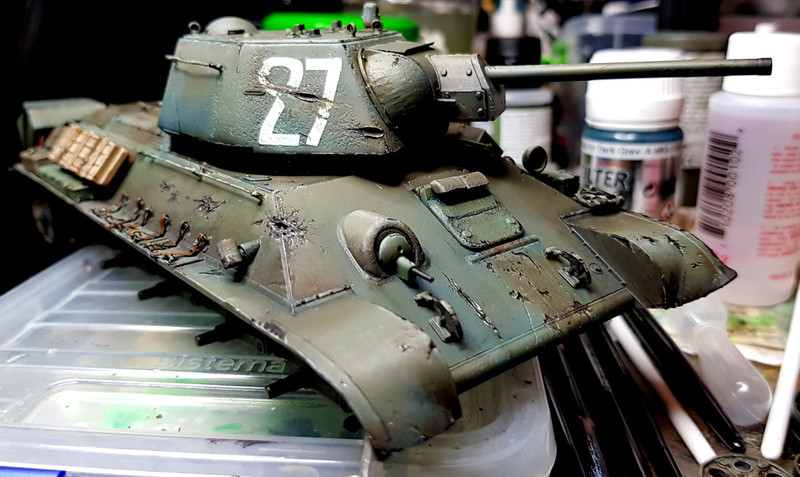 I would like to see more T-34's. Yep,I agree with the above comments! Lookin' good! Looking good. What did you think of the texture roller? Im tempted by the herringbone one so would be good to hear your thoughts. Cheers mate, glad you dig it and pleased the little narrative works! Thanks! It was a load of fun, might have to give the Dragon kit a whirl! :) Thanks J, much appreciated! Thanks! 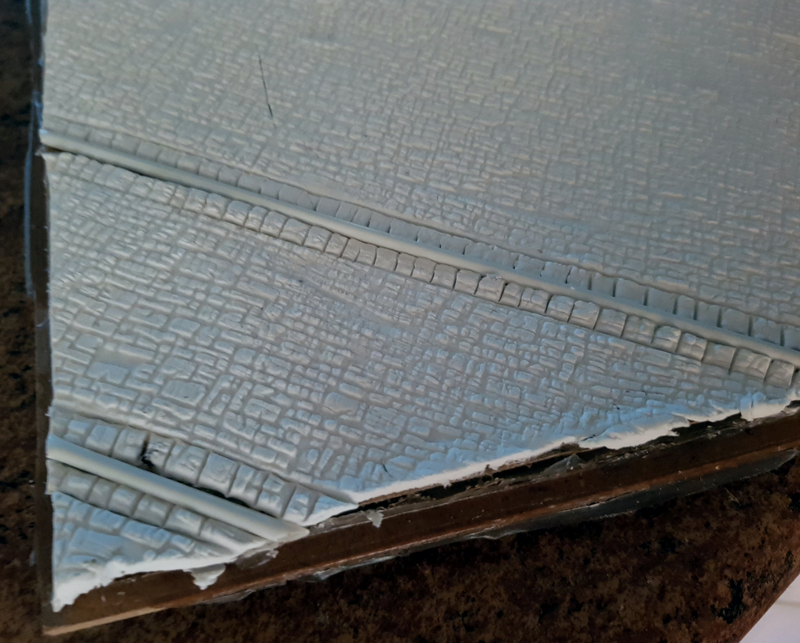 I liked how the roller worked out with the air dry clay. 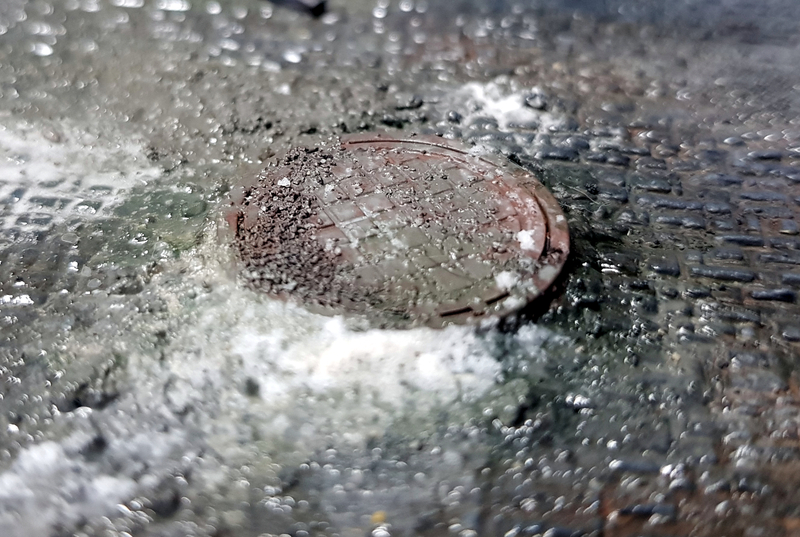 The couple of things I learned was to lay a layer of cling film between the roller and the clay, as trying to clean the roller out was a nightmare! 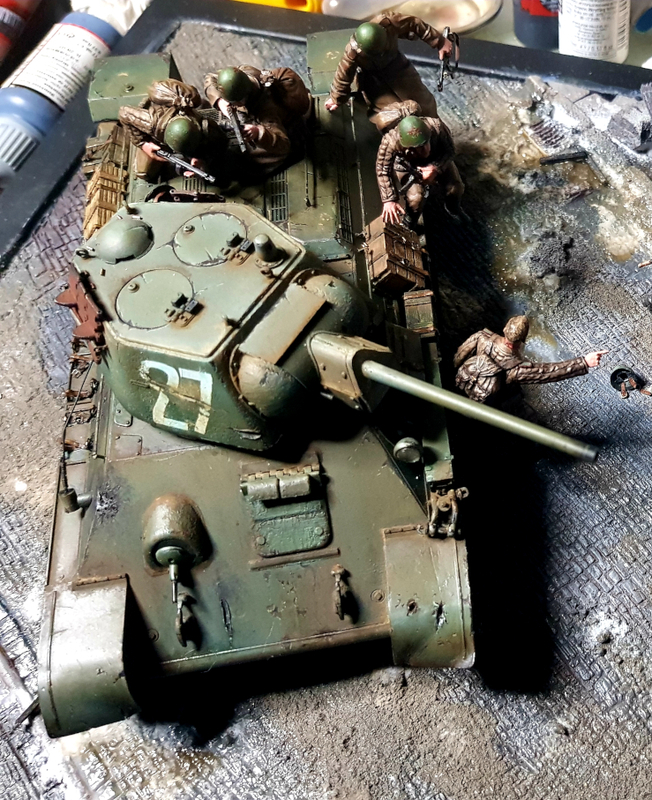 Thanks for all the kind words, and I've completed the dio now so shall post some finished pics shortly!